For the entirety of 2017, every baby born at the Pittsburgh Midwife Center, St. Clair Hospital and UPMC Mercy will begin life as an art collector. Each month in 2017 is assigned to a local artist who will create an image that will only be given to babies born in that month. To view the artists' websites, please click on their name. The drawings, prints, sculpture and site specific installations that I make come out of an engagement with the materials I use, such as paper, drawing materials of all kinds, plaster, mud, fabric and wood. The minimal, abstract forms that emerge from this exploration often embody the shapes of ordinary objects that surround us in our daily lives. Sometimes I work with these objects just as they are. My work has been exhibited at the Carnegie Museum, the Mattress Factory and in many galleries in the United States and Europe and is included in the permanent collections of the Carnegie Museum and the Heinz Endowment. In creating this photograph for your child’s Start with Art I worked with a collection of buttons whose simple geometric shapes and bright colors have delighted me since my own childhood. I began by sifting through my box of buttons, picking and choosing ones that caught my eye and placing them here, then there, on a sheet of white paper. In the process I found myself arranging the buttons in rows and soon began moving them around in this loosely formed grid, taking pictures of each new composition. I liked the easy order of this image as well as its sense that these small objects were poised to move again. Where? It’s anyone’s guess…not unlike the child’s game that gives this photo its title. Mia Tarducci is a visual artist working in Pittsburgh. In The Light is one of her favorites and she is incredibly happy to have it go home with Pittsburgh’s November newborns. The beautiful layers and balance of vivid color tap into her desire to “speak” to those who view it. Mia often thinks that language never seems to contain the right noises, emphasis or weight to equal an emotion. For her, color has the ability to record emotion…It can be used on its own or layered almost endlessly to convey what language cannot. It is Mia's intention that In The Light conveys the joy and optimism which she experienced when painting this piece. Since first showing her work publicly in 2009, Mia has had numerous solo and group exhibitions. Her work has been selected by jurors from the Guggenheim, MoMA, MoCA Cleveland, Carnegie Museum of Art, Andy Warhol Museum, and Mattress Factory for exhibitions, which include both museum and gallery settings in Pittsburgh, Dallas, Scottsdale, Mexico City and New York City. Other notable achievements include being named the Pittsburgh Center for the Arts Emerging Artist of the Year in 2014, winning multiple juror’s awards, and being featured in New American Paintings. In addition, her work can be seen on TV, in movies and in corporate and private collections throughout the world. Please visit www.miatarducci.com to see more of her work! 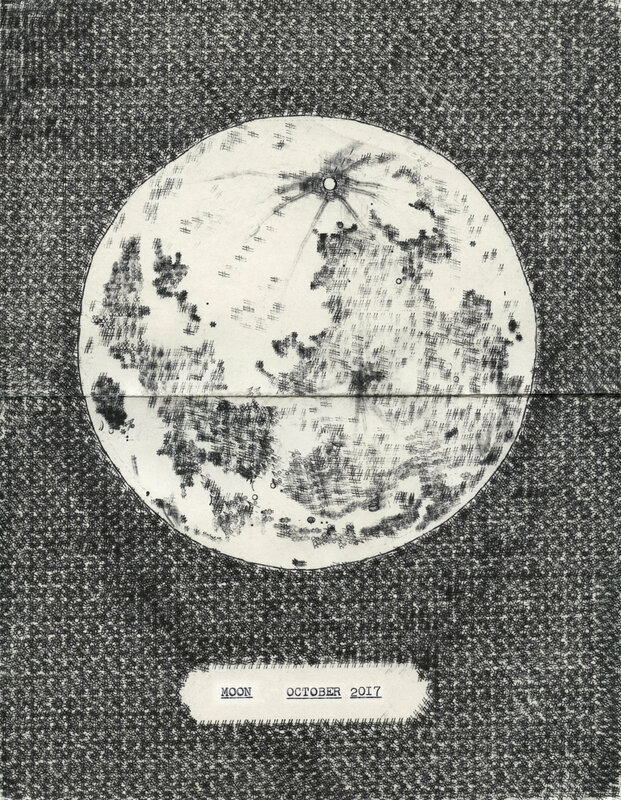 Moon, October 2017 is part of an ongoing series of typewriter drawings made with a portable 1957 Smith-Corona Skyriter typewriter. Lenka Clayton is an artist and founder of An Artist Residency in Motherhood. Her interdisciplinary work considers, exaggerates, and alters the accepted rules of everyday life, extending the familiar into the realms of the poetic and absurd. In previous works she has hand-numbered 7,000 stones; searched for all 613 people mentioned in a single edition of a German newspaper; filmed one person of each age from 1 to 100, and reconstituted a lost museum from a sketch on the back of an envelope. She and writer Michael Crowe are currently in the middle of writing a unique, personal letter to every household in the world. For three years she was the world’s first Artist-in-Residence-in-Motherhood after she founded a fully-funded artist residency that took place inside her own home and life as a mother of two young children. On Mother’s Day 2016 An Artist Residency in Motherhood became an open-source project, there are currently almost 300 Artists-in-Residence-in-Motherhood in 31 countries on six continents. In 2017 Clayton and collaborator Jon Rubin debuted a major new work ...circle through New York commissioned by the Guggenheim Museum that takes place at the Guggenheim and in five other locations in a circle throughout the city including a pet store, a church and a Punjabi TV station. Clayton’s previous work has been widely exhibited including at FRAC Le Plateau in Paris, Kunstmuseum Linz in Austria, Kunsthalle St. Gallen in Switzerland, the Carnegie Museum of Art in Pittsburgh, Anthology Film Archives and MoMA in New York City, Crystal Bridges Museum of American Art in Arkansas, the Tehran International Documentary Festival, and on BBC Radio 4 and Channel 4 Television in the UK. Her work has also appeared in Frieze, Creative Nonfiction, Esquire Russia, The Daily Telegraph, The New Yorker blog, The New York Times, and in the publication "Typewriter Art" amongst others. Clayton has received a Pittsburgh Foundation/Heinz Endowments Creative Development Grant, a Sustainable Arts Foundation Award and in 2014 was presented a Carol R. Brown Award for Creative Achievement. She has taught at institutions in the U.K., US and Sweden and in 2008 was the Theodore Randall International Chair at Alfred University in New York. From 2014 - 2017 she was Artist in Residence at The Fabric Workshop and Museum in Philadelphia, and in Summer 2017 will be artist-in-residence at Headlands Center for the Arts in California. If you would like to see more of her work, please visit www.lenkaclayton.com or if you would like to learn more about An Artist Residency in Motherhood, please visit www.artistresidencyinmotherhood.com. I am a vocalist and educator specializing in opera, classical music, jazz and soul. I am also a Pittsburgh native and the founder and director of inter-disciplinary artist collective Groove Aesthetic, education director at Pittsburgh Festival Opera and studio manager of BOOM Concepts. I have received many awards and grants for my work including Whirl Magazine’s 13 Under 30 in 2015, New Pittsburgh Courier’s Fab 40 under 40 in 2013, Investing in Professional Artists Award from The Heinz Endowments and The Pittsburgh Foundation, and most recently "Best Singer" in Pittsburgh Magazine's Readers Poll. To find out more about me and my work, please visit anqwenique.com. Legacy is a photograph of a physical collage of items that have moved, inspired and guided my personal and creative journey. 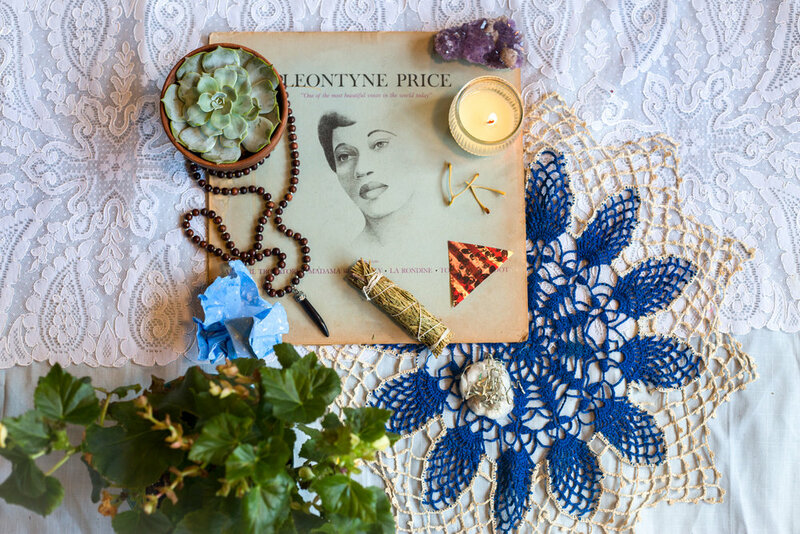 The album cover features the great American soprano, Leontyne Price (who is the reason I chose to pursue a career in singing) and who I also share a birthday with, hence the amethyst in the upper right corner. A candle is included for light, love, and remembering. The crushed blue paper I made while on residency in Sedona, AZ, represents water. The crocheted heirloom was passed down to me from my grandmother. Two wishbones, a necklace with an onyx pendant give me protection and focus. A little ball of cotton with shredded money on top helps me remember the sacrifices made for my existence and the journey of financial freedom. For me, this photo is a snap shot of the past, present, and future. The meaning of the Sanskrit verse is: You have the right to work only but never to its fruits. Let not the fruits of action be your motive, nor let your attachment be to inaction. I am a visual artist. I create large-scale sculptures and immersive installations. Persistence and repetition permeate both image and process in multimedia works. The narratives within my work stem from personal experiences, broader ongoing social conflicts and the fragility of life. The catalyst for these series of prints was my multi-sensory installation A Million Marks of Home, where I drilled through 281 panels of pinewood that lined the walls and juxtaposed them with a bed of 75 pounds of sifted red chili powder. Inspired by those wood panels I drilled through a block of wood and printed it on paper. I chose the contrast of the black and white purposely as children for the first few months of their life don't see any color. I am a contemporary Indian-American sculptor/installation artist . I was born in Gorakhpur, India in 1973. In 2002, I moved to Pittsburgh, Pennsylvania, where I live and work as an artist. I have a Bachelors and Masters degree in textiles at the National Institute of Fashion Technology in India and a BFA from the School of Art at Carnegie Mellon University. My exhibition record includes several group and one-person exhibitions. In addition to the Emerging Artist of the Year show in 2016, I have had solo exhibitions at the Pittsburgh Center for the Arts (2016), the Pittsburgh Cultural Trust’s Gallery as part of the India in Focus Festival (2015), and the Westmoreland Museum of American Art (2016). Important group exhibitions include shows at The Mine Factory (2013 and 2015), the Associated Artists of Pittsburgh’s Annual at the Carnegie Museum of Art (2016), and Double Consciousness at the Mattress Factory Museum (2007). I have shown with the Society of Sculptors (2007, 2014, and 2015), at Space Gallery (2007), Revision Space (2015), and Zora Art Space in Brooklyn (2011). I received the Sally Gehl, Samuel Rosenberg, and Elizabeth Jones Award in Humanities and Art at Carnegie Mellon University and have been awarded residency/exhibition opportunities at Neu Kirche and the Alloy at Carrie Furnace. I also received a juror’s award in a Society for Sculptor’s exhibition in 2014. My artistry is as much a reflection of my own keen intellect and insatiable curiosity as it is a reflection of human experience. Please visit my website www.sarika-goulatia.com to see more of my work! I first fell in love with photography as a teenager studying images in Life and Look magazines. My desire to tell compelling stories has taken me from the mountains of Haiti to African villages to the streets of my hometown in Pittsburgh. My photographs have received international acclaim, including a Pulitzer Prize for work documenting the lives of Burundian and Rwandan survivors of the 1994 genocide. I worked as a photojournalist for the St. Petersburg Times and the Pittsburgh Post-Gazette. My work has also earned the Distinguished Visual Award from the Pennsylvania Associated Press Managing Editors and the Scripps Howard Foundation Award for Photojournalism. My photographs can be found in the collections of the Carnegie Museum of Art, BNY Mellon and the Newseum in Washington, DC. Girl with Bubbles to me is the essence of summer. It conjures up memories of long warm days with few cares or responsibilities. Children at play have been a recurring theme in my work throughout my career and this may be my favorite. This image was made during last summer in Homestead, PA—one of my favorite places to document in Pittsburgh due to the residents’ strong character. If you would like to learn more about Martha and see her other work, please visit www.martharial.com. I am an interdisciplinary artist working primarily in conceptually based photography, LED device artworks, as well as curating exploratory journeys for artists & explorers through a new outdoors program, RiverRouteResidency.com. I have shown my work in museums and galleries across the US and the world, including ones in New York, Houston, Finland, Spain, the United Kingdom, China, Canada, and also (later in 2017) the Moon! I grew up in Carrick, have a studio in Lawrenceville, teach at Penn State Greater Allegheny, and live in Brighton Heights. Visit www.LoriHepner.com to see more of my work! Paddle #0098, #0089, #0092, and #0086 are four photos that I created using a 6-foot tall, computerized LED lights stick, that plays back my landscape photographs from my Arctic adventures. This sequence of photos visualized a part of a ruin of a log cabin that we found while canoeing the Yukon River last summer. I took traditional photographs of the landscapes during the trip and then loaded negative versions of them into my light stick back in my studio. I then moved myself (and the lights) around in front of the camera for 10s at a time while trying to re-enact body movements from paddling, hiking, and walking in the Yukon last summer. Barbara is a Co-Director of the Mattress Factory—a museum that she founded in 1977. She studied at the Art Students League in New York, Cranbrook Academy of Art in Michigan and Carnegie Tech. She has exhibited her sculpture throughout the United States and her work is included in the collection of the University of Pittsburgh, Westinghouse Corporation, and the Wadsworth Atheneum. If you would like to find out more about Barbara, the Mattress Factory, and its 40th Anniversary, please visit www.mattress.org. 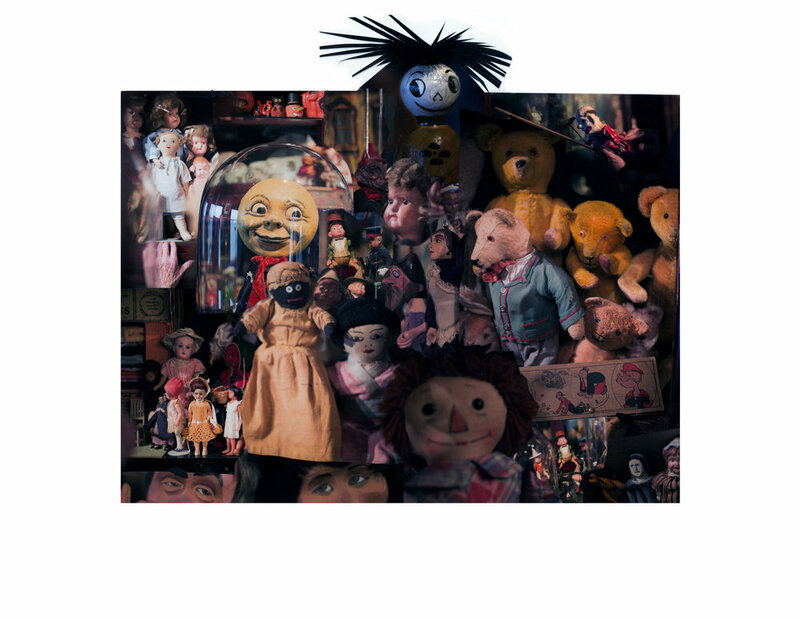 This photomontage was created by Barbara using teddy bears, puppets, dolls, and toys from her personal collection that she displays in her home atop the Mattress Factory. While she grew up with some of these toys, she has found many others at flea markets, auctions, and yard sales. She particularly enjoys finding broken toys and dolls that she can then repair herself. She prefers to see these toys as her diary—each piece has its own story and history and they all combine to tell a new story. She hopes that each of you will find as much happiness in your own toys, stuffed animals, and dolls as she has with these. After attending the University of Missouri for a bachelors degree, Annie O'Neill, received a fiery baptism into professional journalism at The Detroit News, where she worked for two years before joining the Pittsburgh Post-Gazette as a staff photographer in 1995. Her accomplishments in documenting news and other human activity have been recognized by the National Press Photographers Association, Golden Quills, and Society of Newspaper Design. She’s thrice been named Pittsburgh Photographer of the year and twice been named Pennsylvania Photographer of the year. She is the author of Unquiet Ruin - a Photographic Excavation and is working on her second book, The Gift of Work. She was the Ohio University Knight Fellow in 2003/04. She left the world of newspapers to be an independent photographer in 2008. Her clients include: The Heinz Endowments, Cleveland Clinic, LISC, University of Pittsburgh, Landesberg Design, Community College of Allegheny County, Chatham University, The Heinz History Center, Documentary Works, and UMPC. The Future is a photograph of my wife, Nancy, and her sister, Sarah, while they mulled over plans of the future. We took a moment to rest during a walk at a nature reserve near her sister’s house in Virginia. Even before we were actually in the park it felt like a special place from a distance. I was thinking I should have had my “real” camera. But I had my phone and was able to get two frames of this scene before the phone battery quit. It was not until later that night I saw this frame. It’s become one of my favorite photos. Not only because I feel it has a lovely quality but because Nancy and Sarah are very close and it’s a wonderful fact to share with the world. Alisha B. Wormsley is a community-oriented interdisciplinary artist and cultural producer. She has been honored with a number of awards and grants including the Mayor’s Public Art Award for the Homewood Artist Residency, There Are Black People in the Future body of work, and her collaboration with performance artist and opera singer, Lisa Harris. Right now, she is designing art for parks in the Hill District and Larimer. Please visit www.alishabwormsley.com to see more of her work! This photo-montage belongs to a series called For Autistic Black Boys Who Are TOO Curious. This work is inspired by my experience with my nephew and godson who are both autistic and began with my nephew, who has one of the most artistic and beautiful ways of seeing the world. When he was very young I spent a lot of time with him in wonder of the worlds he resided in. I watched, related, and envied his ability to stay in them and the positive and negative effects it had on him and my family. When he was little I read Curious George to him—one of my favorite childhood characters. This work is my attempt to play around in these imaginary worlds while also drawing more serious connections between imperialism and colonialism. Deanna Mance is a self-taught artist whose work has been exhibited at venues including the Pittsburgh Center for the Arts, Bankside Gallery in London, U.K., and the Carnegie Museum of Art. She has been awarded the "Aaronel Deroy Gruber Award" and "Friends of Art" for Pittsburgh Public Schools at the Carnegie Museum of Art, and received "Best of Show" at the Three Rivers Arts Festival in 2010. In 2016, she created one of the first asphalt street murals in Pittsburgh titled City Composition. Located on Strawberry Way, City Composition was awarded "Best Street Transformation: People's Choice" by USA StreetBlog in 2016. She is also the co-founder of an alternative art gallery space, Gold Mine, in collaboration with David Oresick. She lives and works in Polish Hill. My work explores the interplay of the conscious and subconscious, and the relationship between nature and human experience. I use freehand techniques and spontaneous mark making as a tool that allows the work to build and grow without the restrictions of self awareness or premeditation. Through this approach, I embrace the unpredictable qualities and uncertain outcomes of my work. The aesthetic of my work reflects my interests in the passage of time, overlooked details in the everyday and my compulsion towards repetition. Part of my practice includes salvaging found materials that either become integrated within the art making or collected as a source of inspiration. I am creatively fueled by the constraints of limited materials and the act of improvisation throughout my process. Rose Clancy creates site-specific art installations and assemblage sculptures that comment on abuses human beings inflict upon one another, and upon the nature environment in which they live. Her work focuses on the relationship between neglect and nurturing, and explores internal and external transformations that occur within the process of healing and recovery from injury. In an ongoing project, titled Dangerous Objects Made Safe, Rose creates time-based sculptures comprised of hundreds of dangerous rusty objects, each individually wrapped in white cotton fabric. The sculptures are situated in outdoor settings where they are exposed to repeated soakings of rainfall over a period of several months. During this period, iron oxide leaches from the rusty objects and is absorbed into the fabric wrappings, transforming the sculpture’s outward appearance from pristine white to a rich color palette of rusty yellows, oranges, and browns. At the close of each iteration of the project, the sculpture is dismantled and the encapsulated objects are unwrapped to reveal beautifully abstracted rust-stained fabric, full of marks of transformation.